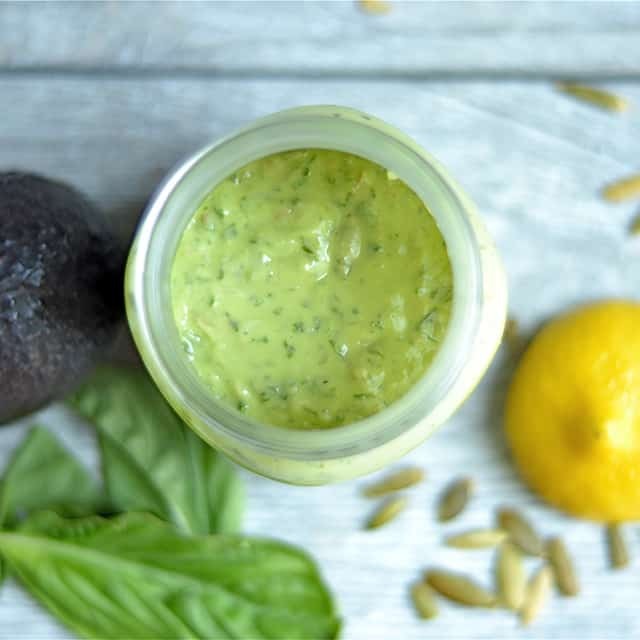 Avocado Pesto is a dairy-free variation of a classic sauce that is versatile and perfect on so many foods! 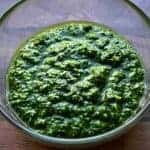 Do you all smother pesto over everything in your house? My kids would eat it everyday of their life if they could, but unfortunately this mama can’t quite keep up with the demand. They love to stick a spoon inside and the jar and eat it plain, they also want it over any piece of meat as a dip, and even with veggies. As you can imagine, we are always running out of a fresh jar. I love pesto too, but unfortunately the dairy doesn’t always agree with my stomach. 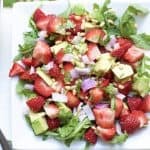 I’ve decided to make a variation involving my favorite fruit, avocado. 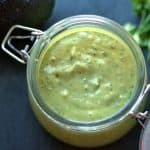 I am absolutely obsessed with avocado, and it works perfectly in pesto! It gives pesto a creamy texture, and still contains the delicious taste of basil and garlic. My kids who are the pesto connoisseurs, had no idea that I swapped out the beloved parmesan cheese for avocado. Add some lemon for a little zing and to prevent browning of the avocado. 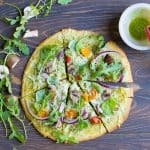 The added pumpkin seeds give a crunchy consistency that is perfect. You can do so much with this easy pesto sauce. Toss with pasta, meat, or even use as a dip. 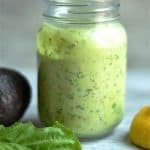 This pesto sauce does not last more than one day, and it probably wouldn’t anyway! You’ll be gobbling it up and tossing it with everything. 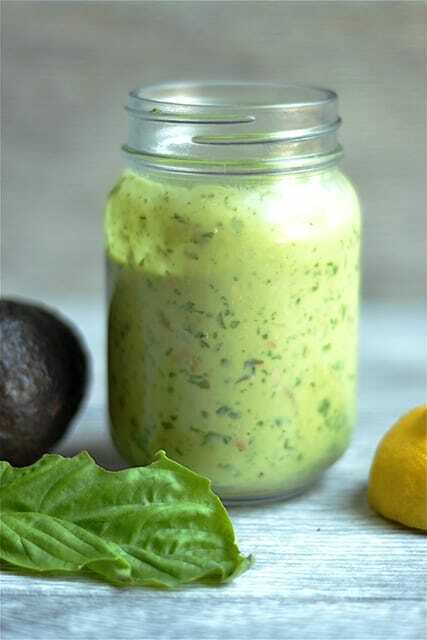 Place basil, avocado, garlic, olive oil, pumpkin seeds, salt, and lemon into a food processor or blender. Blend until smooth, add water while motor is running. Add more salt to taste if needed. I imagine it would be lovely served with salmon too. It looks really creamy – perfect for dipping veggie sticks. Delicious.